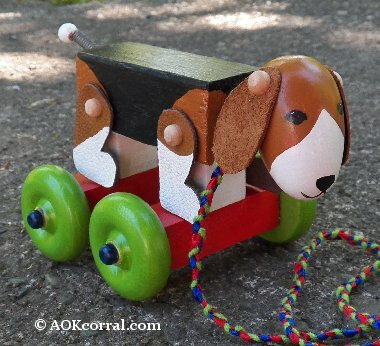 Learn how to make wooden pull toys with our wood toy plans. The PDF Version contains all instructions and patterns in an easy print format. The Easy Print PDF Version contains all instructions and patterns for Dog & Horse without margins, ads or logos. Cut 4 leg/foot pieces according to pattern directions. Cut holes in all pieces at markings on patterns. Make sure your holes are just under 1/4” in diameter so the knob on the wheel axel will hold the leather piece onto the body. For safety, hold the pieces of wood with a hand held clamp for drilling. For best results, make all holes as straight as possible. Measure and mark the center on one side of each of the 1” square pieces and drill straight through at the center mark with 1/4" drill bit. Measure and mark the center on one of the long sides of each of the 3” pieces and then drill about 1/2" into the center mark with 1/4" drill bit. Measure and mark the center on both of the ends of each of the 3” pieces and then drill about 1/2" into the center mark with 1/4" drill bit. On the BOTTOM of the body; draw lines at 3/4" from the front edge and 3/4" from the back edge and measure and mark a perpendicular line down the length of the body at the center. Using your 1/4" drill bit, drill about 1/2" into the body where the lines intersect. On the long SIDE of the body; draw lines at 3/4" from the front edge and 3/4" from the back edge and measure and mark a line 1/2" from the bottom edge. Using your 1/4" drill bit, drill about 1/4" into the side of the body where the lines intersect. On the BACK end of the body; draw a line across the piece at 1/4" from the top edge and measure and mark a perpendicular line at the center. Using your 1/4" drill bit, drill into the body where the lines intersect at about a 45 degree angle, down toward the bottom of the body, about 1/2" deep. On the FRONT end of the body; draw a line across the piece at 1/2" from the top edge and measure and mark a perpendicular line at the center. Using your 7/16” drill bit, drill into the body where the lines intersect at about a 45 degree angle, down toward the bottom of the body, about 3/4" deep. Lay a wood egg on its side and hold with hand clamp. With your 7/16” drill bit, drill straight into the wide end of the wood egg. To find the right position for drilling the ear attachment hole, put together the head and body with the 2” long, 7/16” dowel. Do not use glue at this time. Lay the leather ear against the head where you want to connect it and draw a mark onto the wood through the hole in the leather. Set leather aside. Take the wood egg head off the dowel and use the hand clamp to hold it again while you drill 1/4" deep holes with your 1/4” drill bit at the ear mark locations. Put some glue into the hole at one end of the 3” piece and slide one wheel axel through the wheel and into the hole with glue. Check for excess glue that might touch the wheel and wipe it off. Slide a Popsicle stick on each side of the axel between the inner wheel and the 3” piece to create a small gap between the wheel and the frame. Let dry completely and remove the Popsicle sticks. Your wheels should turn on the axel. Put some glue into the hole along the long side of the 3” piece. Put together the other wheel assembly. Glue the egg head to the front of the body with the 2” length of 7/16” dowel. Pinch the end of the spring together and insert through the wood bead. Bend the tip of the spring to secure the bead in place. Put some glue into the hole at the back of the body and insert the other end of the spring. Glue the wheel assembly dowel into the bottom of the body. Let all pieces dry together. Paint the pull toy and let dry. Optional: varnish or clear coat the toy for shine, let dry completely. To attach the ears and legs; put some glue into the holes and use the axel plugs to secure the ears and legs to the head and body. Paint and varnish the axel plugs if desired.